You are here: Home / Beauty / Michelle Obama’s Gray Nail Polish – New Trend! Michelle Obama’s Gray Nail Polish – New Trend! She’s done it again. With unlikely nail color and a few dramatic hand gestures, the First Lady has catapulted a new beauty trend into the mainstream. On Tuesday during her impassioned speech at the Democratic National Convention, the First Lady’s blue-gray nails got as much buzz as her Tracy Reese dress. Equal parts Katy Perry and high school goth, the color was an unusual choice for a political figure, no less a woman over 30. But Michelle Obama doesn’t follow style rules, she reinvents them. 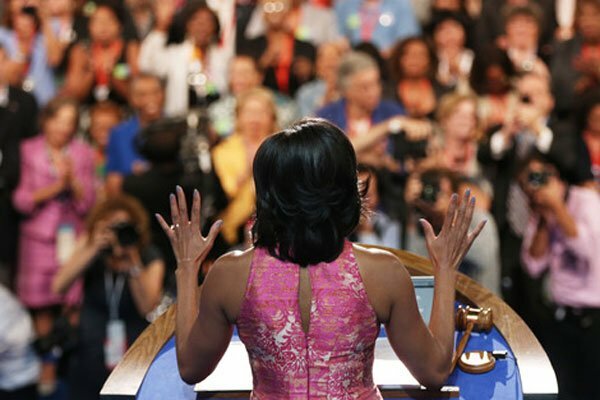 By the second day of the convention, Michelle’s gray nails were still intact and beauty bloggers were on a mission to identify her polish of choice. Was it Chanel? O.P.I? Artistic Nail Design Colour Gloss Soak-Off Gel is a versatile product that’s the ultimate long-lasting non-peeling, quick light-cured, chip-proof gel manicure that provides a super-shiny high-gloss finish. Fast as well as stunning…and lasts for an incredible 21 days! The bad news: It’s a kind of polish mostly available in salons only. The good news: Salons are stocking up on it. By Thursday morning, Artistic Nail Design’s U.S. headquarters was flooded with requests from manicurists interested in “stocking the Artistic Colour Gloss color that Michelle Obama was seen wearing,” according to the beauty company’s spokesperson. Because the $15.95 polish is a long-lasting, chip resistant gel that requires a UV light source for drying, it’s mainly applied by the pros. While many women are converts, the chemical ingredients in the formula have been criticized for their potential to cause allergic reactions and nail damage. On the plus side, your nail color lasts for 21 days without chipping. That’s a big selling point when you and your hands are about to step up to a podium in front of millions. The type of polish may have been a no-brainer for Michelle, but how did she decide on the unconventional color? Maybe she looked to the runway. Gray polish has been a bonafide trend on the runway since 2011, when Rag and Bone’s designers sent backstage tweets of their models’ nails, and Dior debuted Vernis Gris Montaigne, a darker gray polish. Everyone from beauty bloggers to color-obsessed tweens have jumped on the trend. But after Tuesday, gray nails have gone mainstream. « BB and CC Creams are they worth it?